I have had tune-ups for many many years. This was no tune up. Aside from checking temperatures and spraying a foam inside the inside unit, there was no vacuuming out of the drain line, or treatment of the drain line. He just focused on selling me a new AC and a contract. Your reviews have not been great, but I thought I would give you a chance. I won't use you for anything again. As a Realtor, I also will not recommend you. I am a new customer to your co. and feel very secure in knowing that Jupiter-Tequesta will be taking care of my a/c needs.. Arrived on time (actually a few mins early). Tech was very polite. Issue was diagnosed quickly and resolved. I highly recommend using them. Went out to the Home Show last week and made contact with Jupiter-Tequesta (although I turned down their free plunger). Hector came out today and walked us through the process of replacing our AC unit, explaining our options and the myriad of financing available. No BS just to get a sale - he was very patient and thorough. Looking forward to working with Hector and the team going forward. Hector is a very knowledgeable and competent techician. Arrived on time and worked expeditiously. He cleaned up after the job was finished. Would recommend him highly. Hector Rivera, A/C Specialist was here today to install a UV System GAR7-50DR. He was on-time, courteous and efficient. It was installed quickly and without any problems. Above all, he was understanding, a good listener and he answered all my questions. I would highly recommend him and the Jupiter-Tequesta AC Co. Polite and competent tech. Completed work efficently and cleaned up. Very satisfied. Excellent. From the initial call to arrange the service appointment to the time the representative left our home. Robin (customer service rep) was informative and reassuring. Hector (technician) was professional and thorough. 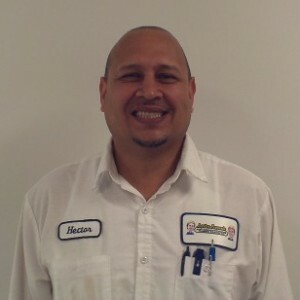 Hector came to help restore our AC - he was professional, resolved the issue and took time to explain exactly what was done and why. Outstanding customer service!